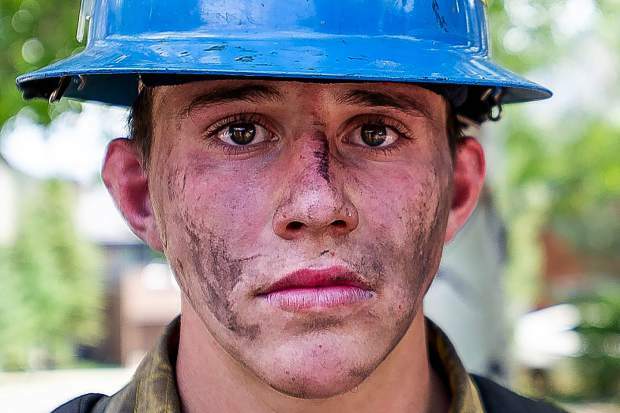 Oregon firefighter Markus Idroga after working the line on the Lake Christine Fire on Sunday afternoon. 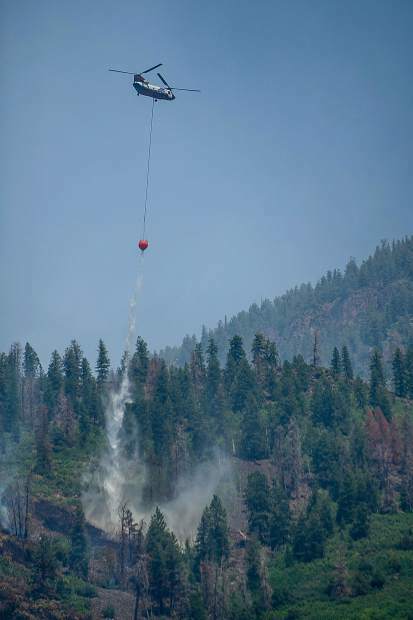 A Chinook helicopter drops a bucket of water on Basalt Mountain from Cedar Drive on Sunday afternoon. Oregon firefighter Markus Idroga puts out hot spots above the Wilds neighborhood in Basalt from the Lake Christine Fire on Sunday afternoon. Oregon firefighter Martin Sierra walking back from the line on the Lake Christine Fire on Sunday afternoon. From left, firefighters Martin Sierra, Ismael Corona, and Martin Sierra put out hot spots above the Wilds neighborhood in Basalt from the Lake Christine Fire on Sunday afternoon. 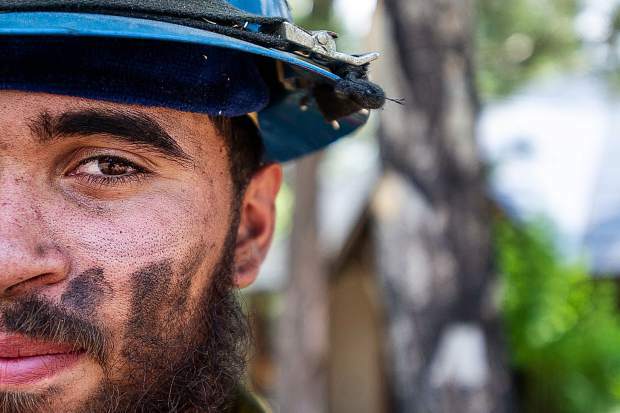 Oregon firefighter Martin Sierra after working the line on the Lake Christine Fire on Sunday afternoon. 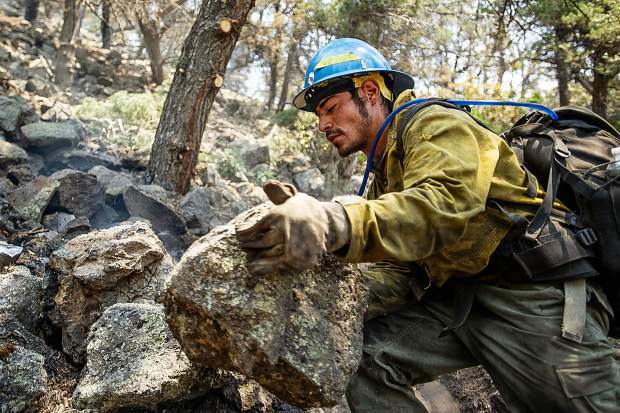 Oregon firefighter Ismael Corona moves rocks and puts out hot spots above the Wilds neighborhood in Basalt from the Lake Christine Fire on Sunday afternoon. The Lake Christine Fire in Basalt on Sunday. Oregon firefighter Markus Idroga walking back from the line on the Lake Christine Fire on Sunday afternoon. 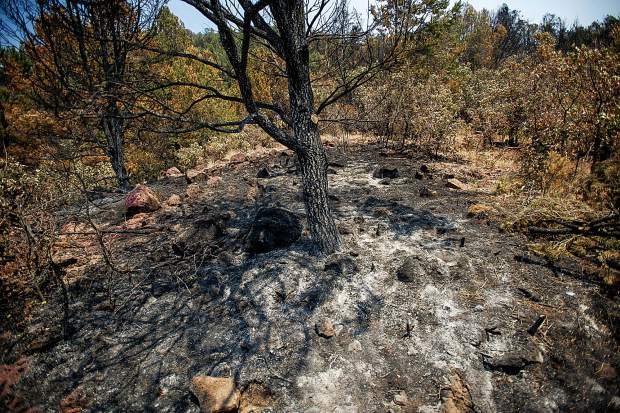 A burnt area above the Wilds neighborhood in Basalt from the Lake Christine Fire on Sunday. Oregon firefighters Markus Idroga, left, and Martin Sierra put out hot spots above the Wilds neighborhood in Basalt from the Lake Christine Fire on Sunday afternoon. 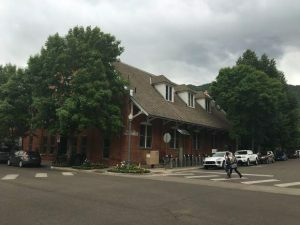 As businesses began ushering customers back into the heart of downtown Basalt on Sunday, local and national fire crews continued battling the Lake Christine Fire not far above the small town’s main drag. 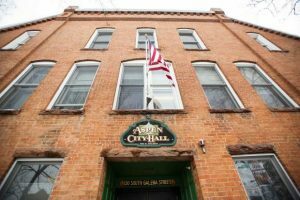 Just up the road from popular eateries and well-known watering holes, a Snowmass Village police officer blocks and makes sure those entering Sopris Drive have the proper credentials — no residents, and absolutely zero sightseers get waved through the barricades. 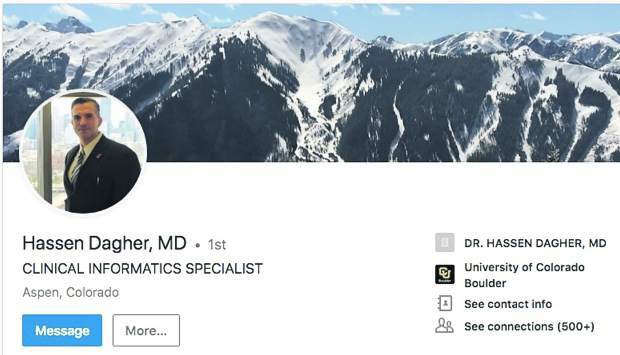 Farther up is another checkpoint, manned by a Pitkin County sheriff’s deputy, who doubles down on making sure only authorized personnel enter the volatile area. Heading along Pinon Drive, propane tanks litter abandoned driveways as American flags from the Fourth of July whip in the wind. Parking at the cul-de-sac at the top of the drive, one cannot help but acknowledge the gun range where the Lake Christine Fire started the evening of July 3. Barbed-wire fence with numerous Colorado Division of Wildlife signs warn, “Danger — shooting range beyond this sign.” Some of those signs now are covered in fire retardant from slurry drops. The “danger” now is of another sort. 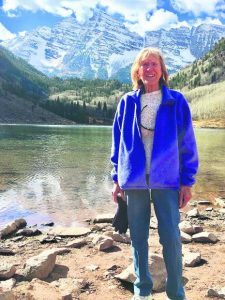 The usually serene, summertime Basalt Mountain side Sunday instead roared with chainsaws on the ground as well as a dual-propeller Chinook helicopter and firefighting aircraft constantly flying overhead. 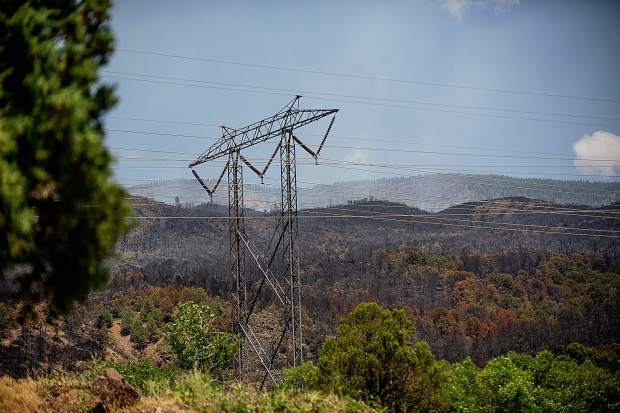 The ground looked like black soot, and the once green vegetation remained covered in pinkish-red fire retardant just footsteps away from critical power lines. 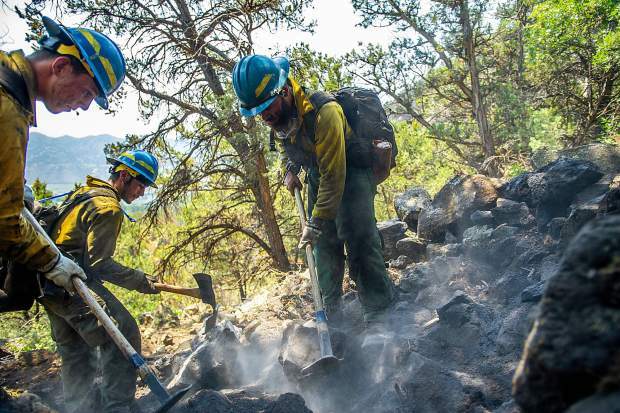 When firefighters from the Lost River Fire Management crew, based out of Klamath County, Oregon, emerged for a quick hydration break, they looked like coal miners finishing a grueling day. However, it doesn’t take long for Markus Idrogo and Ismael Corona to quickly return to searching for hot spots — an incredibly dangerous, and tedious task. 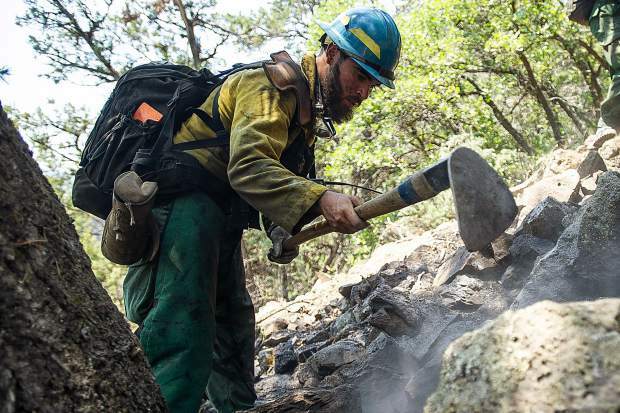 Carrying a 25-pound chainsaw and brushing off his dusty goggles, Idrogo, as he catches his breath, described the working conditions as erratic with low humidity, lots of fuel and steep slopes. Always communicating with one another, the three cut down large branches, diligently dug with Super Pulaski axes and, at times, literally put the backside of their bare hands on the charred, black ground to feel for potential hot spots. 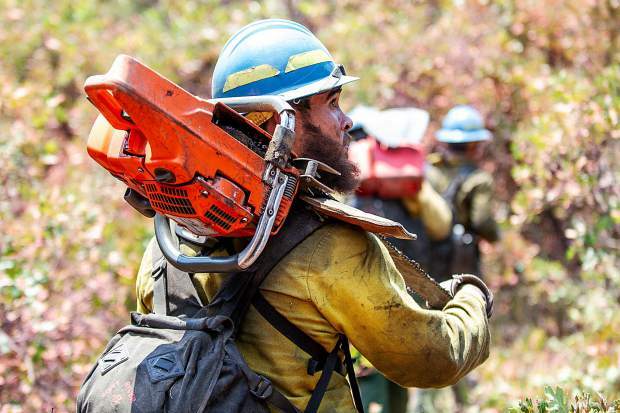 Right out of high school, Martin Sierra — also with the Lost River Fire crew — appeared unfazed by the daunting job in front of him. 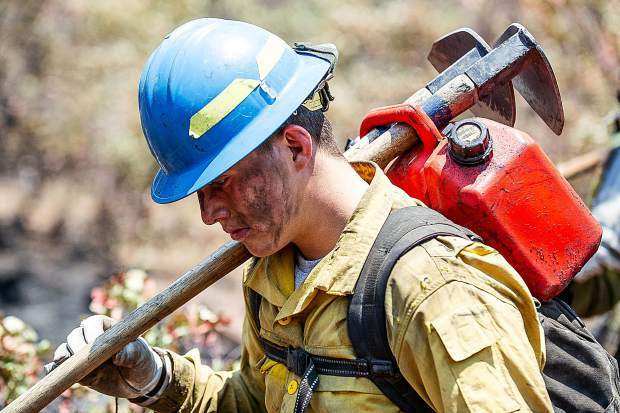 Baptized by the Lake Christine Fire, which has burned 5,900 acres as of Sunday and displaced thousands of residents since it blew up Tuesday, served as Sierra’s first firefight. 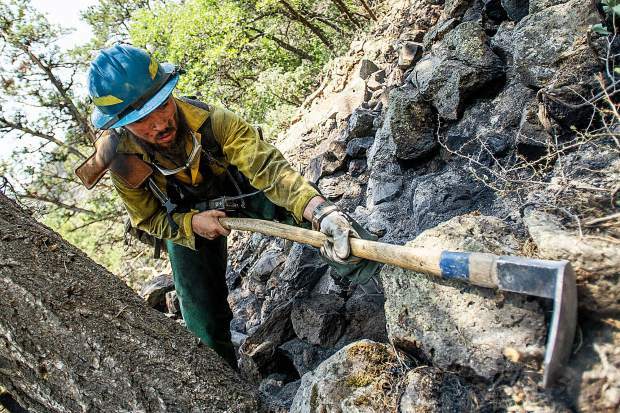 Without missing a step, the young firefighter weathered the steep and rocky topography like a seasoned veteran. 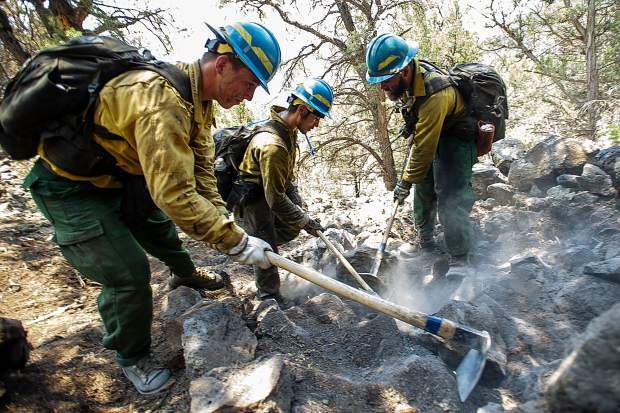 “The cool thing is that it’s a sisterhood, it’s a brotherhood of firefighters,” Operations Section Chief Jim Grant said of the camaraderie among the crews from all over the country assisting with the Lake Christine Fire. 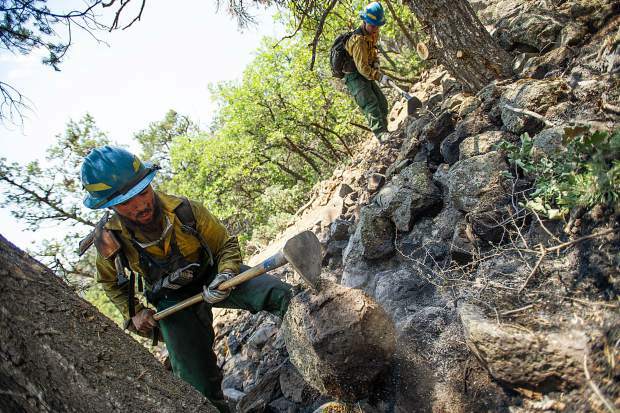 Emergency personnel welcomed the rain that doused Basalt Mountain late Sunday afternoon, but warned of the fire’s ongoing severity. While setbacks occur, like a bulldozer overturning and injuring a firefighter Saturday, luckily those affected escaped with just bumps and bruises. “Absolutely, it could have been worse and communication is essential,” Grant explained. “If we cannot maintain LCES (lookout, communications, escape routes, safety zones) we don’t engage. … We have to communicate with the public all the time; we have to provide safety for them, as well.